Contemporary flavours, techniques and textures are the focus at Ormeggio, with Alessandro exploring for himself the current Northern Italian offerings. "I love to embrace traditional recipes that have been handed down through the families of my region – and in particular my grandmother, who was a tremendous cook. Traditional Italian dishes, flavours and ingredients are reworked in a new and innovative way." Combine 250ml water, ¼ teaspoon yeast and salt in a mix master bowl fitted with a dough hook. Stir until yeast has dissolved. Mix on low speed and slowly add flour until dough is smooth, add a little more water if needed. Place dough ball into a lightly oiled bowl, cover with cling wrap. Set aside in a warm drought free place for 3 hours or until dough has doubled in size. Turn dough out on a floured surface and knock back (punch) the dough to remove excess air. Add ½ cup polenta and remaining yeast and knead until smooth, add a little more water if needed. Leave to rest again for 30 minutes. Cut broccoli into florets, reserving stalks. Using a vegetable peeler, peel the outer layer of the stalk. Cook broccoli florets and stalks in a large saucepan salted boiling water. Remove florets after 1–2 minutes or until bright green, drain and place in a bowl ice water. Cook stalks for a further 1–2 minutes, drain and place in a bowl ice water. Heat oil in a large frying pan and sauté half the broccoli florets with garlic for 2 minutes. Remove garlic and transfer broccoli to a food processor. Process until mixture is pureed. Cut remaining florets into smaller pieces. Using a vegetable peeler, peel stalks into thin slices. Set aside between wet paper towel. Divide dough into two balls. Roll out one piece of pizza dough to form a 30cm disc. Dust a large square piece baking paper with half of the remaining polenta. Place dough on the baking paper and press the dough to form thick edges. Prick base with a fork or pizza docker. Transfer pizza and baking paper together onto the pizza stone and close the lid. Cook for 3 minutes or until base is crispy. Open the lid and remove pizza carefully. 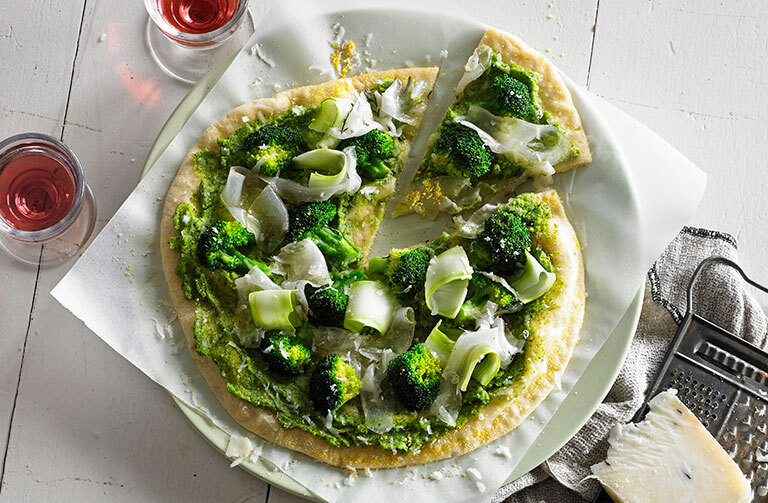 Spread with ¼ cup broccoli pesto and arrange with half broccoli florets. Return pizza and close the lid and cook for a further 1–2 minutes or until cooked to your liking. Monitor cooking progress through viewing window. Topping should be cooked and base crisp and brown. Open lid carefully with oven mitt and remove pizza onto a chopping board. Roll up broccoli slices. Top with broccoli slices, lardo and pecorino cheese.